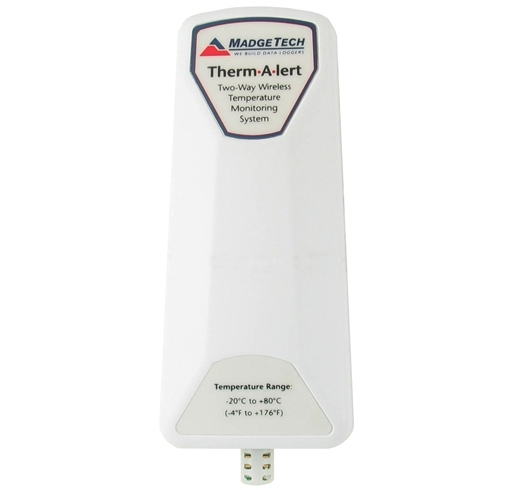 The MadgeTech Therm•A•Lert-RH is a humidity and temperature monitoring and alarming system, designed specifically for laboratories, warehouses and other environments where temperature and humidity monitoring is critical. The system can be used to monitor a single location, or expanded to monitor hundreds of locations over a broad area (additional MadgeTech wireless loggers and transceivers may be required). 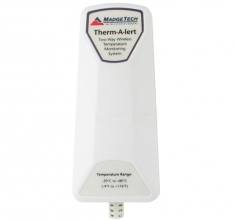 The Therm•A•Lert-RH provides real time wireless, or wired, notification of humidity and temperature. The data logger features user programmable alarms that can be configured to send a message via text message (standard SMS rates apply), on-screen alarm and/or via e-mail if an alarm condition is met. The Therm•A•Lert-RH device is equipped with two-way wireless communication. MadgeTech wireless systems offer a flexible and robust integration for many applications. One PC can provide control and communication to all the wireless loggers within range, or the system can be divided into smaller subnets (using a different RF channel). In addition to the data being transmitted wirelessly, the Therm•A•Lert-RH also stores each reading to non-volatile internal memory for a secure backup. Customers can also set up automatic archiving preferences, ensuring all data is saved and retained to comply with federal regulations.